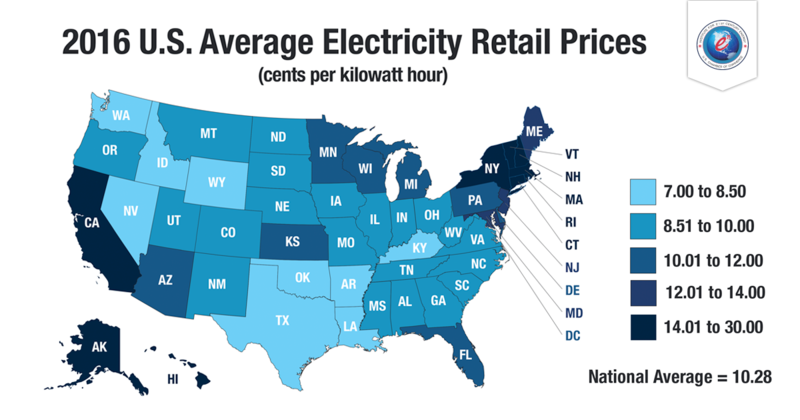 Each year, the Energy Institute issues an update of our annual retail electricity price map, based upon the year-end electricity price data released by the U.S. Energy Information Administration. The prices shown on our map best reflect what business, industry, and consumers must pay for a given unit – or kilowatt hour (kWh) – of electricity. This year’s map, with the most complete data for calendar year 2016, appears above. Two years ago, our map illustrated that retail electricity prices rose in all but a single state. Last year’s map identified a slight reprieve from escalating prices in twenty states and the District of Columbia, but the remaining thirty states continued to watch their electricity bills soar. Given the repetitive and duplicative imposition of Federal policies seeking to limit our access to affordable, reliable, and domestic energy fuels and generation resources, the upward trend for electricity prices was not surprising. However, 2016 brought some good news. In spite of efforts to make energy less affordable by the Obama Administration, relief came to the pocketbooks of many electricity customers in 2016, and such relief is spelled S—H—A—L—E. That’s right, in addition to the massive job and national economic benefits resulting from the use of hydraulic fracturing to extract previously inaccessible domestic natural gas deposits, the natural gas resulting from this advanced recovery technique contributed to lower electricity prices in 2016. Hawaii and Alaska continue to endure the highest electricity prices, primarily due to their remote geography and limited access to a diverse supply of electricity generation resources. In a little bit of good news, Hawaii continued its downward trend from last year by shaving more than 2 cents/kWh off its 2015 retail electricity prices. Twenty-seven states, including perennial high-cost states such as California, New York, and many in New England, experienced declines in their 2016 average retail electricity prices. Maine was the exception, but fortunately for Mainers –their 12.84 cent/kWh retail rate remains the lowest among its high-cost neighbors. Vermont held steady at the exact same rate experienced in 2015, giving its residents a sentimental victory over the upward trend experienced in years prior. Don’t get me wrong; the states that continue to chase energy-limiting policies continue to be burdened by the highest electricity prices in the nation. These anti-consumer policies, such as the Regional Greenhouse Gas Initiative and California’s AB 32, are “highlighted” by the expensive electricity prices seen in New York, California, and New England. However, the expansion of America’s vast shale resources has at least softened the blow of these policies due to the fact that these states are highly dependent upon natural gas for a large share of their electricity generation. With respect to the Northeast, they could further moderate their high prices if they embraced the numerous benefits available through the enhancement of their currently limited natural gas pipeline infrastructure. Another group of states that generally saw a decrease in rates were those that produce natural gas, such as Texas, Pennsylvania, and Oklahoma. In fact, eight of the top ten natural gas producing states saw a decline in their average electricity price. On the flipside, twenty-three states witnessed an increase in their electricity bills in 2016. Among these were many low-cost leaders, such as Iowa, Kentucky, Utah, Washington, West Virginia, and Wyoming. These specific states are traditionally reliant upon coal for a large share of their electricity mix, with the exception of Washington State which depends primarily upon hydroelectric resources. Despite the small 2016 increase, they continue to enjoy some of the lowest electricity prices in the nation thanks to the historically reliable and low-cost nature of the resources upon which they rely. Overall, however, the decreases outweighed the increases, resulting in a lower national average 2016 retail electricity price of 10.28 cents/kWh. This new average represents a modest – but quite welcome – .13 cent/kWh decrease from 2015’s national average electricity price. With a new Administration in the White House, we expect state-level policies to play a greater overall role in the electricity prices consumers pay each month. All indications are that the federal government will reduce its recently harmful intervention in energy markets while reducing the red tape that for many recent years has stymied our ability to produce and transport low cost and reliable sources of energy. Thanks to the extraction of shale gas on primarily state and private lands, America’s vast energy resources have stemmed the tide of an upward spiral in electricity rates. If this Administration enhances access to shale and the many other sources of energy available on Federal lands, the next few years have the potential to continue 2016’s trend toward lower retail electricity prices. Note: In order to eliminate any confusion that may arise when making a direct comparison of this year’s map to the 2015 rate map, it is important to note that we utilize the U.S. Energy Information Administration’s (EIA) preliminary annual data, from the February edition of Electric Power Monthly, to develop our annual maps and rate comparisons. The EIA’s preliminary data is then subject to modification in the subsequent months as EIA finalizes their price data. We use EIA’s preliminary data in order to deliver timely information, but slight variances from the final figures do occur. Please note, however, that for the purposes of comparing year-over-year trends, we have used EIA’s near-final 2015 numbers instead of the preliminary numbers used in our 2015 map to maximize the accuracy of our trend analysis. More Evidence that the Energy Revolution has Sparked a Manufacturing Renaissance in the U.S.